I have yet to meet anyone that has heard the music of Ol' Savannah who can be described as ambivalent towards this bunch of Canadian ‘hillbillies.’ People seem to love them or hate them (although hate is probably a little strong!) and I for one love ‘em! They are a breath of fresh air with their slightly off kilter take on hillbilly music that blends so much more without ever losing sight of those roots. Artists are often described as having a unique style or bringing originality to whatever genre they are working in, something that is almost as often, an exaggeration! 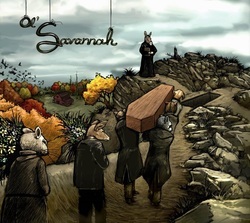 I can say in all honesty that there is no one around currently who is even remotely like Ol’ Savannah, in fact I’m not sure there has ever been anyone like them! The lovely instrumental blend contrasts and often clashes with the raw vocals that Tom Waits in his pomp would have killed to possess, but it actually blends beautifully bringing a dark threatening beauty to every song on the album. studio trick until I sent him youtube links to some of their live performances. His response? They are the real deal! All songs, with the exception of a tremendous version of the Balfa Brothers Valse De Balfa, are written by Speedy and Bartleby either solo or together, obviously two men on the same wave length with a vision of their music that is constantly evolving, drawing in new ideas that keep everything so fresh and original. Overall the album has a darkness that few can match, with an atmosphere that is an evocation of the ‘hillbilly’ scenes in the old movie ‘Deliverance’ There is always a threatening otherworldly atmosphere to the music, giving the impression that should the listener ever meet this talented band it would be as well to tread very carefully! descends into darkness, but always with the light instrumentation providing an excellent contrast, although soon we have a changed vocalist being encouraged by some bawdy shouting before the darkness intensifies! Strangely, the overall darkness of the album is sometimes offset by the beauty of the instrumental blend, and yet conversely, there are other occasions where the gorgeous sound of the accordion and banjo playing together, actually deepens the darkness. This will definitely be one of my albums of the year simply because their ability to portray this sinister otherworld has never and probably never will be bettered. A great album that you really should buy and then lose yourself in it’s eerie beauty!